Posted by sneaks in adult, J is for Juvenile, nonfiction. June 13, 2008 New observations from NASA’s Phoenix Mars Lander provide the most magnified view ever seen of Martian soil, showing particles clumping together even at the smallest visible scale. In the past two days, two instruments on the lander deck — a microscope and a bake-and-sniff analyzer — have begun inspecting soil samples delivered by the scoop on Phoenix’s Robotic Arm. Posted by sneaks in J non-fiction, nonfiction, spring. The UN adopted June 20 as World Refugee Day to bring attention to the plight of the millions of people around the world who have been displaced from their homes by persecution, war, natural disaster, scarcity, and other reasons. The refugee challenge in the 21st century is changing rapidly. People are forced to flee their homes for increasingly complicated and interlinked reasons. Some 40 million people worldwide are already uprooted by violence and persecution, and it is likely that the future will see more people on the run as a growing number of push factors compound one another to create conditions for further forced displacement. Today people do not just flee persecution and war but also injustice, exclusion, environmental pressures, competition for scarce resources and all the miserable human consequences of dysfunctional states. The task facing the international community in this new environment is to find ways to unlock the potential of refugees who have so much to offer if they are given the opportunity to regain control over their lives. A display on natural disasters, recent conflicts (i.e. Sudan, Somalia, Iraq, Tibet), and the countries recently affected by catastrophic events (Myanmar, China, Sri Lanka, Indonesia) would be a great way to commemorate this day. Local Events: The Creative Alliance hosts Somalia on these Shores Friday June 20 and Saturday June 21 at 8pm. Posted by sneaks in adult, fiction, nonfiction, spring. The PEN/Beyond Margins Award celebrates outstanding books by writers of color published in the United States during the previous year. 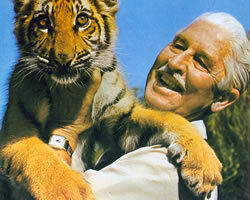 Previous Beyond Margins winners when you click “more”. Posted by sneaks in J is for Juvenile, J non-fiction, nonfiction, YA. Tween girls 8-12 are spending some $500 million annually on beauty products according to the NPD Group’s newest report, Insight Into the Youth Beauty Market, which in addition to tweens looks at a broader spectrum of youth consumers 8-24 years old. In the survey tween girls report first using beauty products at 10 years old. Enough reason for a mini-display of beauty books in Young Adult, wouldn’t you say? 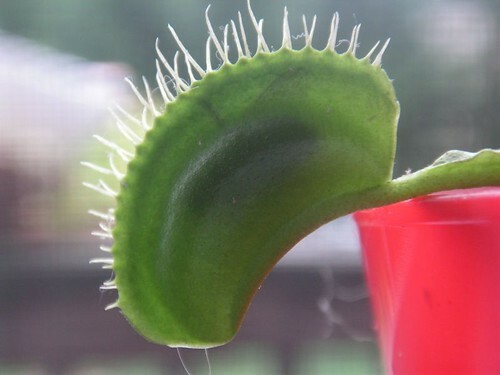 Posted by sneaks in adult, display topics, fiction, nonfiction. The Interpreter of Maladies by Jhumpa Lahiri. The Metamorphosis by Franz Kafka. Posted by sneaks in adult, fiction, J fiction, J is for Juvenile, spring, YA. NEW YORK, May 1 /PRNewswire-USNewswire/ — Mystery Writers of America is proud to announce its Winners for the Edgar Allan Poe Awards 2008, honoring the best in mystery fiction, non-fiction, television and film published or produced in 2007. Posted by sneaks in adult, nonfiction. Throw some cookout cookbooks on the grill. Here’s a BBQ-inspired playlist to put you in the mood. Posted by sneaks in adult, fiction. There’s a new award in town! Finalists for the 2007 Shirley Jackson Awards were recently announced. In recognition of the legacy of Shirley Jackson’s writing, and with permission of the author’s estate, the Shirley Jackson Awards have been established for outstanding achievement in the literature of psychological suspense, horror, and the dark fantastic. Among the nominees are Baltimore, by Mike Mignola and Christopher Golden; Sharp Teeth, by Toby Barlow; and Like You’d Understand, Anyway by Jim Shepard. Check ’em out! 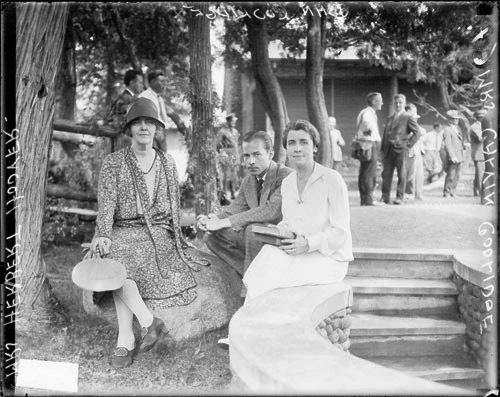 Mrs. Calvin Coolidge, John Coolidge, and Mrs. Herbert Hoover sitting in the yard of a house. Chicago Daily News, Inc., photographer. 1928. DN-0085098A, Chicago Daily News negatives collection, Chicago Historical Society. Dear First Lady: Letters to the White House is soon to arrive at BCPL. The book’s author, Dwight Young, has been making the rounds, and was recently featured on NPR. What a terrific reason to make a display highlighting America’s First Ladies, from Martha Washington to Laura Bush. It can be tough to get at these in CARL, so print this list of presidents in alphabetical order, to make your stroll through Biography a little easier. Posted by sneaks in adult, coloring pages, display topics, J fiction, J is for Juvenile, J non-fiction, nonfiction, spring. Congratulations to mother and zoo on the recent birth of the first pachyderm born in Baltimore since the last ice age! Despite much-publicized financial problems, the Maryland Zoo in Baltimore was able to care for the mother, 24-year-old Felix, sufficiently well during her 22 months of pregnancy, that delivery of the 290 pound calf was relatively smooth. Support the zoo by fanning the flames of interest in our new Marylander with a display of elephantine materials. Scour the 599’s, pull books about Africa from 960 and 916, and highlight Alexander McCall Smith’s Akimbo and the Elephant. PrintableBaby elephant coloring pages available here and here. Posted by sneaks in great ideas, nonfiction, spring. Here’s a cute idea courtesy The YA YA YAS, a trio of Young Adult librarians in Hawaii. For March, Gayle made a green-themed display, with books on money, veggies, the environment, and other subjects associated with the color green. Does it work for other colors? Yellow: the sun? cowardice? bananas? Ok, it doesn’t work for yellow. Orange: Florida, citrus fruits… doesn’t really work for orange either. 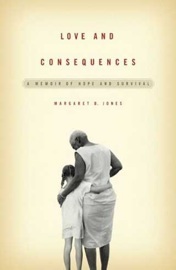 In light of all the publicity surrounding Margaret B. Jones‘s faux memoir, Love and Consequences, and BCPL’s decision to keep the book, but label it as fiction, how about a display of recent popular autobiographies, both real and fallacious? Posted by sneaks in adult, display topics, great ideas, J is for Juvenile. Whenever an author speaks in our area, we notice an increase in queries about that person. Wouldn’t it be great to know ahead of time when someone like Michael Chabon or Lisa See was going to be in town? 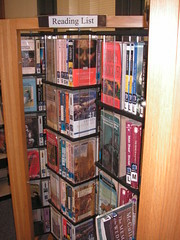 Then we could merchandize that author’s books, along with similar works by other authors. Now you can, with the online database BookTour. Started by Chris Anderson, author of The Long Tail, BookTour magically ascertains your location and tells you which authors are planning a visit, as well as letting you browse the schedule of your favorite author or your favorite venue. You can get updates via email, on your calendar – you can even zoom around the world and through time to find your favorite authors, using BookTour’s GoogleEarth interface. LibraryThing Local offers similar listings, though it is more venue-centric than author-centric. Between the two of these tools, it’s a lot easier nowadays to keep abreast of local literary happenings. Posted by sneaks in adult, display topics, J non-fiction, nonfiction, YA. Nearly a quarter cannot identify Adolf Hitler, with ten percent thinking Hitler was a munitions manufacturer. More than a quarter think Christopher Columbus sailed after 1750. Fewer than half can place the Civil War in the correct half-century. A third do not know that the Bill of Rights guarantees the freedom of speech and religion. Half have no idea what the Renaissance was. Nearly half think that The Scarlet Letter was either about a witch trial or a piece of correspondence. Ouch! Take the test yourself (PDF), and then how about putting together a display of historical fiction, classics, and the most gripping history books you can find? You could even print copies of the quiz and challenge parents and teens to compare their scores. London during the Great Exhibition of 1851 by George Shove. ca. 1851; printed map on leather. The National Archives, U.K. The Festival of Maps runs from March 16 through June 30, 2008. Take this opportunity to put out a display of atlases and maps, books of exploration, and movies and fiction with plots involving maps. Two recent art heists (articles here and here) have us thinking of The Thomas Crown Affair, Ocean’s 12, and books like The Lost Painting and Noah Charney’s recent The Art Thief. Find some big beautiful art books and pair them with some classy true-crime stories and mystery fiction for a fun midwinter display. Posted by sneaks in display topics, nonfiction. The article appears in the March issue of Woman’s Day (pdf here). It might make a nice printout alongside a selection of books about starting a business, women in business, biographies of Carly Fiorina, etc. Posted by sneaks in J fiction, J is for Juvenile, J non-fiction, nonfiction, Picture Books, winter. This event takes place February 15-18. Participants can enter their bird count results on the event’s web page, where you can also find regional bird checklists. A little nature might be just what your displays need during these short cold days. You might print out our regional bird list, and display a batch of bird books – books from 598 as well as picture books and fiction featuring birds, such as The Snow Goose, The Trumpet of the Swan, Perry’s Baltimore adventure, Little Louie Takes Off, and others. Posted by sneaks in adult, coloring pages, display topics, fiction, J is for Juvenile, nonfiction, winter. And no, that’s not some snide comment on this year’s Presidential elections… it’s what 2008 will be in the Chinese zodiac. The new year begins February 7. Celebrate it with a display of red and gold paper, along with selections from Dewey 951, 915.1, cookbooks from 641.5951, fiction by Amy Tan, Lisa See, Laurence Yep, Anchee Min, Ha Jin, and Maxine Hong Kingston (look here for a good list), and biographies (just search CARL on China biography). Coloring pages here and here. Posted by sneaks in adult, display topics, J is for Juvenile, J non-fiction, nonfiction. NASA’s Messenger space vehicle has traversed the “dark” side of Mercury and sent back the closest, highest-definition pictures ever taken of that part of the planet. See them on NASA’s web site and the web site of JHU’s Applied Physics Lab. Posted by sneaks in adult, display topics, nonfiction, winter. According to the U.S. government, these are a few of the most popular resolutions people make this time of year. Support the willpower of your customers with strategically placed displays of books that reinforce all of our highest aspirations. Check out the entire list here. Posted by sneaks in adult, BCPL best practices, cube fixtures, display topics, fiction, nonfiction, recommended by. Eyewitness books flew off our secondary cubes, and a dump devoted to titles ordered in for our “Crime Time” branch generated booklist empties regularly. All 200 copies of our first “Staff Recommends” booklist are now gone and are responsible for 200 items added to our YTD circulation. Each bookmark left tucked into a copy of one of those titles ordered in and on display on the top shelf of that popular area. Posted by sneaks in adult, display topics, fiction, great ideas, J fiction. 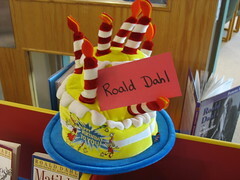 Here’s a super-quick way to draw attention to an author on his/her birthday – just plop a fancy birthday hat on the shelf or display! It will surely draw attention to the author’s books and throw a little unexpected fun into browsing the children’s section. Or, heck – why not do it in adult fiction too? Posted by sneaks in adult, display topics, Fall, J is for Juvenile. 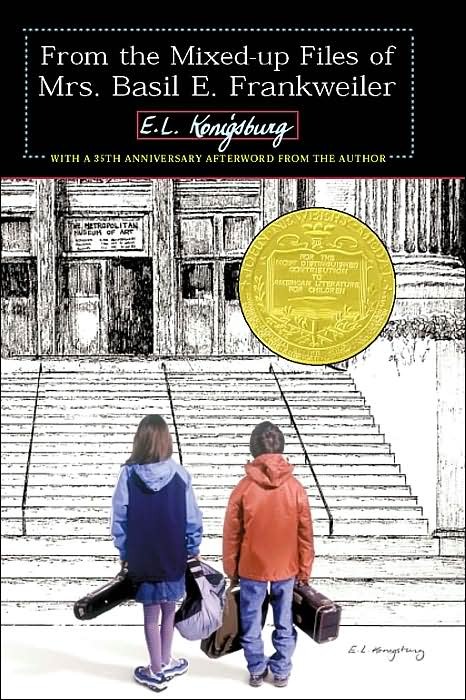 To mark the 13th anniversary of Native American Heritage Month in November, the National Educational Association has released a recommended reading list that includes titles ranging from such pre-K classics as Mama, Do You Love Me to Tony Hillerman’s Joe Leaphorn Series that has been thrilling young (and older) adults for more than a decade. Titles are listed by grade level and include fiction, nonfiction, and poetry. Posted by sneaks in adult, display topics, nonfiction. Not too many people can say, “Well, I used to be Vice President of the United States, but then my career really took off after that.” Al Gore is the first man in history to win both an Academy Award (well, his name isn’t on the statue but he was the one gripping the thing onstage) and a Nobel Peace Prize. Copies of An Inconvenient Truth are likely to evaporate from the shelves like methane from a cow pasture. Back them up with other books about climate change and environmentalism, or with books by other Presidents and Vice Presidents. Jimmy Carter‘s got a new one coming out (Beyond the White House: Waging Peace, Fighting Disease and Building Hope), in addition to last year’s Palestine: Peace not Apartheid. Boy, it’s a great season for movies. Several new ones have ties to literature – here’s the rundown. Elizabeth: The Golden Age. Cate Blanchett reprises her Oscar-worthy performance as the Virgin Queen. Break out the biographies and the Elizabethan historical fiction. 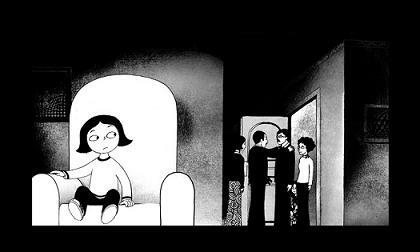 Marjane Satrapi‘s semi-autobiographical graphic novel, Persepolis, is now an animated feature film. Satrapi has written several follow-ups to Persepolis, as well as a picture book for children, Monsters are Afraid of the Moon. Joaquin Phoenix and Jennifer Connelly star in Reservation Road, based on the novel by John Burnham Schwartz, recently published in paperback. The Assassination of Jesse James by the Coward Robert Ford is the story of, uh, the assassination of Jesse James… a few biographies and western-themed historical novels might make a neat display. Gone Baby Gone, a movie about a kidnapped child directed by Ben Affleck, is the second of Dennis Lehane‘s novels to be adapted for the big screen. and lastly, The Wolves in the Walls, the weird but wonderful children’s book by Neil Gaiman and Dave McKean, has been made into a stage play. Playing at the New Victory Theater in New York city through October 21. Posted by sneaks in adult, display topics, Fall, J is for Juvenile, J non-fiction, nonfiction. Now that the back-to-school frenzy has eased into mere school-year mayhem, think about supporting students and parents with a spotlight selection of skills materials. Some schools have sent out their first trimester progress reports. You may see increased interest in books about the process of learning to read, math skills, and writing. A display of books from the following call numbers might serve as a go-to resource for parents at their wits’ end. Posted by sneaks in adult, display topics, Fall, nonfiction. The nation celebrates National School Lunch Week October 15-19. The site is worth a click perhaps for the terrifying characters alone. Yumi Rice Bowl is gonna appear in my nightmares, that’s for sure. School lunch has been getting a lot of attention in recent years, due to bad news about childhood obesity and worse news about school budgets. For example, a new study by the Center for Ecoliteracy emphasizes how good nutrition can affect children’s health and school performance. The Edible Schoolyard is a project out of Berkeley that promotes school gardens as sources of nutrition education, science education, and lunchroom veggies. A new book by Jessica Seinfeld helps parents make it work. Click “more” to see others. Posted by sneaks in adult, display topics, J is for Juvenile. How interactive are your displays? Catonsville always seems to make a point of inviting customers to recommend materials to their fellow patrons. On a recent visit we noticed a table near the front door with the sign pictured above. Patrons (and staff) are invited to pick a book from the shelves that holds particular meaning, slide a “This book changed my life” bookmark into it, perhaps writing a brief explanation of how you have been affected by the book, and leave it for others to enjoy. This thought-provoking display really invites inspection. It’s an interesting question and some of the answers are bound to be interesting too. In the children’s section, leaf-shaped slips of yellow and orange construction paper were there for kids to write in their favorite book. The leaves were then taped to a lovely autumn tree painted on a large window. Nice job, Catonsville, for displays that are both aesthetically and philosophically beautiful. Posted by sneaks in adult, Fall, fiction. Doris Lessing, “that epicist of the female experience, who with scepticism, fire and visionary power has subjected a divided civilisation to scrutiny,” was awarded the Nobel Prize for Literature today. Posted by sneaks in adult, DVDs, Fall, fiction, J fiction, J is for Juvenile, J non-fiction, nonfiction, YA. Into the Wild, Jon Krakauer‘s engrossing nonfiction book about the life and mysterious death of Christopher McCandless in the Alaskan wilderness, has been made into a movie, in theaters now. Support your copies of Into the Wild with other books by Jon Krakauer, and other tales of wilderness survival (or not), such as the following (click “more” for a list). Posted by sneaks in adult, BCPL best practices, graphic novels, great ideas, manga, paperbacks, problem solving, science fiction, series books. 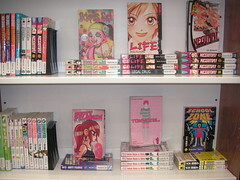 Stack each issue of the same series horizontally, with the least shelf-worn issue face-out on top. If there are more than 4 or 5 issues of the same titles, space permitting, you might want to put the face-out issue to the immediate left of the stack. Posted by sneaks in adult, display topics, dump, fiction, great ideas, J fiction, J is for Juvenile, summer, wire shelving. 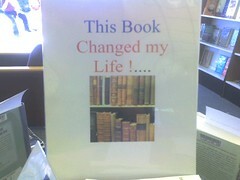 Here’s a time-saver (not to mention a shelf-space saver), spotted at Howard County’s Miller branch. Take those tried-and-true perennial reading list titles (Animal Farm comes to mind, also A Lesson Before Dying, Things Fall Apart, Night, A Tale of Two Cities) that we keep multiple copies of just for summer, and give them their own little fixture. Here they’ve used paperback carousels, but a batch of dumps might work well too. You can save a bunch of shelf space by keeping your multiples of Watership Down and 1984 off the regular fiction shelves. During the summer, it’s one-stop shopping for the folks who come in clutching their lists, and you could even wheel the whole unit to some inconspicuous place once the summer reading season is over. 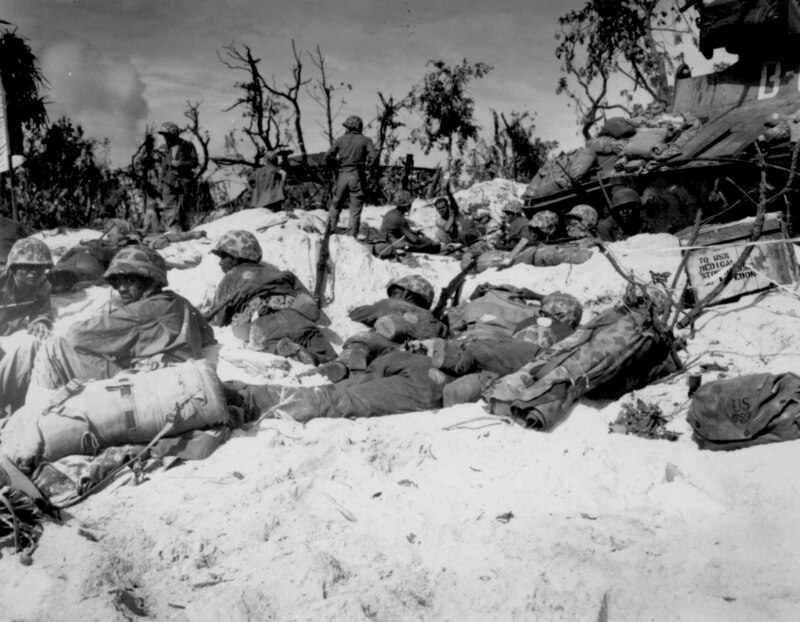 “Peleliu Island…Marines move through the trenches on the beach during the battle.” September 15, 1944. Fitzgerald. 127-N-9527. Photo from the National Archives collection Pictures of African Americans in WWII. Premiering on September 23, it’s The War, a seven-part documentary series that tells the story of World War II through the stories of the war’s veterans. Letters are read, grainy footage is aired, hearts are broken. Expect increased demand for WWII histories and historical fiction. Satisfy your patrons with lots of books, and with supplementary information from such online sources as the Library of Congress’s Veterans History Project and the National Archives center for Veterans and their families. In addition, each of the U.S. Armed Services have extensive archive sites for unearthing the history of individuals, companies, battalions, ships, etc. 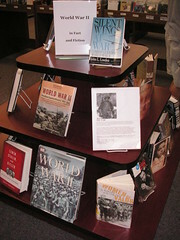 “The War” display at Howard County’s Miller branch. 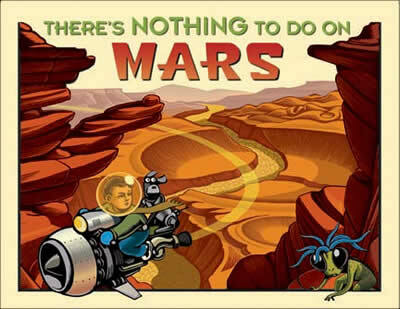 Posted by sneaks in adult, Fall, fiction, programming tie-ins, props and drapes, science fiction. October’s Big Read puts us in the unusual position of having tons of new copies of one book to merchandize – let’s make the most of it! Posters, bookmarks, CDs and Reader’s Guides are on their way to your branch, but it’s not too early to start thinking up display ideas. And don’t forget props and signage! 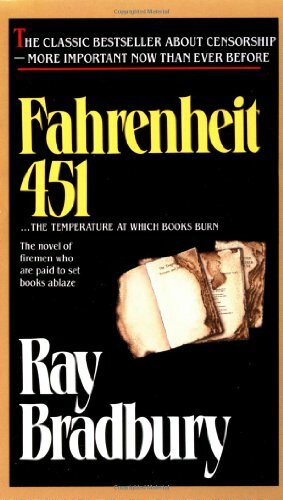 Fahrenheit 451 is about censorship and book burning, so you might display lists of banned books, toy firefighter helmets or fire trucks to make your display stand out. As the books disappear, back up this selection with other books by Ray Bradbury, books from the frequently-challenged lists, and other books on dystopian societies. Posted by sneaks in Fall, graphic novels, manga, YA. Bust out your graphic novels, manga and comic books – all your favorite authors and artists will be at Baltimore Comic-Con! The convention runs September 8-9 at the Baltimore Convention Center. Posted by sneaks in adult, coloring pages, display topics, DVDs, E, fiction, J fiction, J is for Juvenile, nonfiction, summer, YA. Celebrate the 60th anniversary of India’s independence next Thursday, August 15. DVDs! Cookbooks! Kids’ books! We’ve got it all: click “more” to see lists of books and authors. And click here or here for coloring pages! Posted by sneaks in adult, display topics, DVDs, J is for Juvenile, nonfiction, summer. On a hot day, it’s very tempting to keep the kids inside and park them in front of the TV. Give parents and caregivers an alternative to cartoons by putting out some of your more exciting non-fiction DVD’s. Click “more” for some suggestions. Posted by sneaks in adult, coloring pages, display topics, fiction, J fiction, J is for Juvenile, series books. It appears that Hollywood thinks librarians are gonna like the new movie Stardust. They’ve thrown free screenings just for us, they’ve sent free tickets and posters… well, heck, throw in Peter O’Toole, pirates, Robert DeNiro and Michelle Pfeiffer, not to mention Neil Gaiman, and ok, I’ll bite! 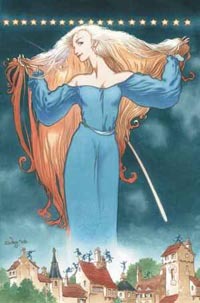 Stardust is a lovely old-fashioned fairy story, originally published as a graphic novel, but later released without illustrations. Display it with other Gaiman titles, like Neverwhere and Coraline, and with other fairy-centered books: Tuck Everlasting, The Various, Spiderwick, Emily Rodda, Terry Pratchett’s Wee Free Men books, E. Nesbit, Artemis Fowl, Michael Buckley’s The Sisters Grimm series, Jane Yolen… and for adults, John Connolly’s Book of Lost Things, Jonathan Strange and Mr. Norrell, J.R.R. Tolkein, Gregory Maguire, and Laurell K. Hamilton. Elizabeth Rafferty in Youth Services is the one to contact about posters and tickets. Gorgeous fairy coloring pages here and here.